Science Magazine picks up our article on a breakthrough at the NSF-funded Center for Integrated Access Networks (CIAN), where engineers have generated short, powerful light pulses on a chip -- an important step toward optical interconnects that will likely replace the copper wires carrying signals between chips inside today's computers. CIAN's UCSD group is based in Calit2. The Times of India reports on a breakthrough at the NSF-funded Center for Integrated Access Networks (CIAN), where engineers have generated short, powerful light pulses on a chip -- an important step toward optical interconnects that will likely replace the copper wires carrying signals between chips inside today's computers. CIAN's UCSD group is based in Calit2. Yahoo! News India reports on a breakthrough at the NSF-funded Center for Integrated Access Networks (CIAN), where engineers have generated short, powerful light pulses on a chip -- an important step toward optical interconnects that will likely replace the copper wires carrying signals between chips inside today's computers. CIAN's UCSD group is based in Calit2. PhysOrg.com, one of the leading web-based science, technology and research news services, picks up our story on the most recent UCSD Greenovation Forum (held at Calit2). The forum featured presentations on ongoing methods for mitigating and adapting to risks posed by climate change and rising ocean levels in Venice, Italy and San Diego. PhysOrg.com picks up Calit2's story about a breakthrough at the NSF-funded Center for Integrated Access Networks (CIAN), where engineers have generated short, powerful light pulses on a chip -- an important step toward optical interconnects that will likely replace the copper wires carrying signals between chips inside today's computers. CIAN's UCSD group is based in Calit2. Cable Spotlight, a product of TMC.net, reports on the latest breakthrough at the NSF-funded Center for Integrated Access Networks (CIAN), where engineers have generated short, powerful light pulses on a chip -- an important step toward optical interconnects that will likely replace the copper wires carrying signals between chips inside today's computers. CIAN's UCSD group is based in Calit2. San Diego Newsroom reporter Claire Harlin reports on Calit2-affiliated archaeologist Thomas Levy's research, which is the focus of a new NOVA/National Geographic documentary. Levy discovered thousands of tons of slag, a by-product of smelting ore, in the Faynan region of Jordan, which suggests that large-scale copper production took place in the 10th century BCE during the time of the Biblical kings Solomon and David. MSNBC's Alan Boyle reports on research being conducted by Calit2-affiliated archaeologist Thomas Levy that has turned up ancient copper-smelting equipment and a huge ancient cemetery, as well as carbon-dating samples that suggest the site was at its peak during the biblical king Solomon's reign. The Sydney Morning Herald's Peter Hartcher quotes Calit2 Director Larry Smarr in a story about Australia's proposal for a national broadband network, calling him someone "with real technological expertise" and writing that "when the rest of us were buying our first VCRs, Smarr was already building a network that we would later discover as the internet." Medical News Today picks up a story about bioengineers at UC San Diego (including an affiliate of Calit2) who have created an artificial environment for stem cells that simultaneously provides the chemical, mechanical and electrical cues necessary for stem cell growth and differentiation. Science Daily reports on bioengineers at UC San Diego (including an affiliate of Calit2) who have created an artificial environment for stem cells that simultaneously provides the chemical, mechanical and electrical cues necessary for stem cell growth and differentiation. The University of Nevada, Reno, media newsroom publishes a story about upcoming talks, including one by Calit2 Director Larry Smarr. 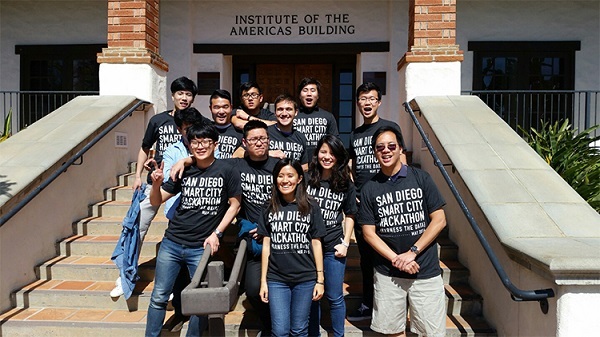 Lab Spaces, a social network for the scientific community, shared news about engineers at UC San Diego (including an affiliate of Calit2) who have created an artificial environment for stem cells that simultaneously provides the chemical, mechanical and electrical cues necessary for stem cell growth and differentiation. Science Magazine's Science Daily News reports on bioengineers at UC San Diego (including an affiliate of Calit2) who have created an artificial environment for stem cells that simultaneously provides the chemical, mechanical and electrical cues necessary for stem cell growth and differentiation. RedOrbit reports on bioengineers at UC San Diego (including an affiliate of Calit2) who have created an artificial environment for stem cells that simultaneously provides the chemical, mechanical and electrical cues necessary for stem cell growth and differentiation. What’s Your Dream for the Future of California? The Lifeboat Foundation, a nonprofit nongovernmental organization dedicated to encouraging scientific advancements while helping humanity survive existential risks, reports on California Dreams, a call for entries on imagining life in California in 2020. (Calit2 is a partnering institution). DailyWireless.org, an independent blog about all forms of wireless communication, reports on Calit2's Ocean Observatories Initiative, which will will monitor and forecast environmental changes in the oceans on global, regional and coastal scales. Strategic News Service, the most accurate predictive newsletter covering the computing and communications industries, quotes Calit2 Director Larry Smarr's remarks from a panel discussion on avoiding climate catastrophe. An editorial in the Milwaukee Journal-Sentinel encourages the Milwaukee 7 region to follow in the footsteps of institutes like Calit2, which provides "resources, space and support for high-end research." The Chronicle of Higher Education's Eric Kelderman reports on Rand Stieger, who began his two-year tenure as composer-in-residence at Calit2 in July. Bruce Bigelow of Xconomy.com reports on the work of Calit2-affiliated researcher Kevin Patrick, who will serve as the keynote speaker at the Xconomy Forum on Health IT. TMC.net, "the world's largest communications and technology community," features a story about the Calit2 WIISARD project's endeavor to streamline the way first responders are tracked in disaster situations. The influential news service TMC.net features a story on Calit2 researcher Albert Lin's quest to use the power of human computation to find antiquities in Mongolia. Satellite spotlight, which publishes materials pertinent to the military, satellite communications and other industries, picks up our story on The Immersive Tech Awards (the Immys), which counted among its recipients the Calit2 StarCAVE. North County Times' Mark Walker reports on a collaborative effort between San Diego County and Calit2 at UC San Diego to install eight cameras on towers in San Diego's backcountry as a tool for preventing wildfire destruction. BioInform's Uduak Grace Thomas reports on UCSD's $25 million initiative to build the iDASH Center, or Integrating Data for Analysis, Anonymization, and Sharing. Calit2 is a partner in the project. Dr. Dobb's, which reports on "the world of software development," reports on UCSD's $25 million initiative to build the iDASH Center, or Integrating Data for Analysis, Anonymization, and Sharing. Calit2 is a partner in the project. San Diego 6 reports on Calit2's FireSight project, a system of 50 live webcams that provide digital images of San Diego's backcountry. The project was funded by a $36,000 grant from the county Board of Supervisors. Fox 5's Jenn Karlman reports on a collaboration between Calit2, CalFire and the San Diego County Board of Supervisors to establish a system of 50 webcams to monitor wildfires in San Diego's backcountry. KPBS picks up the San Diego Union-Tribune's story about 50 webcams are broadcasting from mountaintops, including 16 high-resolution cameras installed over the past few weeks. The project is spearheaded by Calit2. The North County Times reports on 50 fire webcams that are now broadcasting from mountaintops, including 16 high-resolution cameras installed over the past few weeks. The project is spearheaded by Calit2. The Reno, Navada, CBS affiliate reports on 50 high-def cameras that were installed for the San Diego fall fire season under the FireSight program, a partnership of Calit2. 10 News reports on reports on Calit2's FireSight project, a system of 50 live webcams that provide digital images of San Diego's backcountry. The project was funded by a $36,000 grant from the county Board of Supervisors. "KSWB Fox 5 San Diego"
A video report by Fox 5 details a collaborative effort between San Diego County and Calit2 at UC San Diego to install eight cameras on towers in San Diego's backcountry as a tool for preventing wildfire destruction. "KFMB San Diego News 8"
News 8 picks up a story about 50 webcams that are broadcasting from mountaintops, including 16 high-resolution cameras installed over the past few weeks, to detect wildfires The project is spearheaded by Calit2. The Union-Tribune's Kristina Davis reports on Calit2's FireSight project, a system of 50 webcams that will broadcast fresh images every two minutes from the region’s mountaintops. The project is an effort to give an early glimpse of wildfires in remote areas and allow fire chiefs to make decisions quickly as the fire behavior changes. GreenTMCnet runs a story about the inaugural Immersive Technology Awards, which granted the Calit2 StarCAVE a prize for best immersive visualization innovation in research and education. Wired's Tim Carmody compiles a gallery of images depicting robotics research being conducted by Javier Movellan, an associate professor affiliated with the Calit2-based Machine Perception Laboratory. The Medical News picks up our story on a team from the UCSD School of Medicine, which has received two federal grants totaling more than $25 million to develop new ways to gather, analyze, use and share vast, ever-increasing amounts of biomedical information. MediLexicon, the world's largest online database of pharmaceutical and medical abbreviations, reports on two federal grants to develop new ways to gather, analyze, use and share vast, ever-increasing amounts of biomedical information. Calit2 is a partnering institute in the grants.